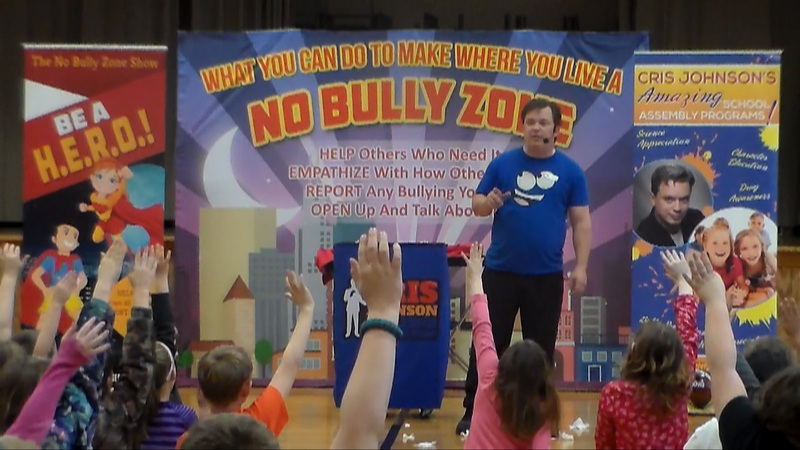 This Modern, 21st-Century Anti-Bullying School Assembly Teaches Students How To Be A H.E.R.O.! 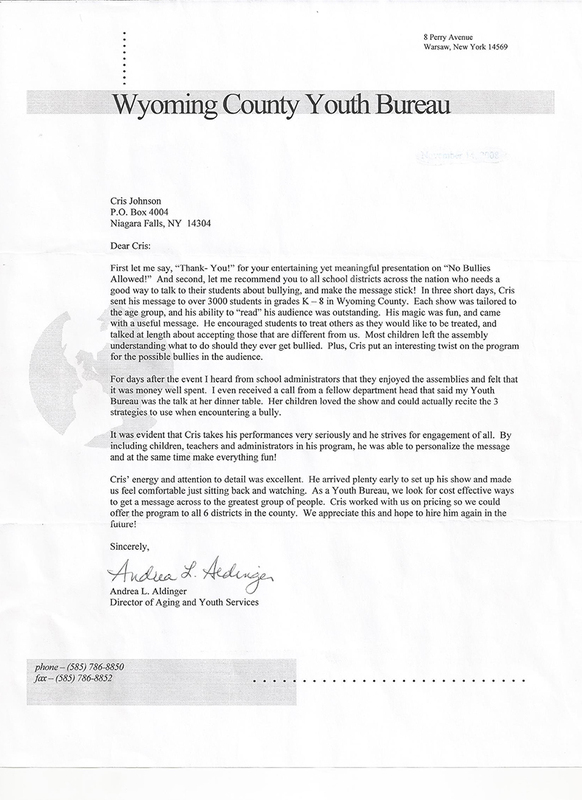 Like many kids, I was bullied growing up. I was the kid who liked all the unpopular shows – while most kids were dressing up like G.I. Joe characters for Halloween, I was dressing up like Mr. Spock from Star Trek. Yup, I was different. Kids don’t want to be lectured about bullying. A Truly Engaging Bully-Prevention Assembly! 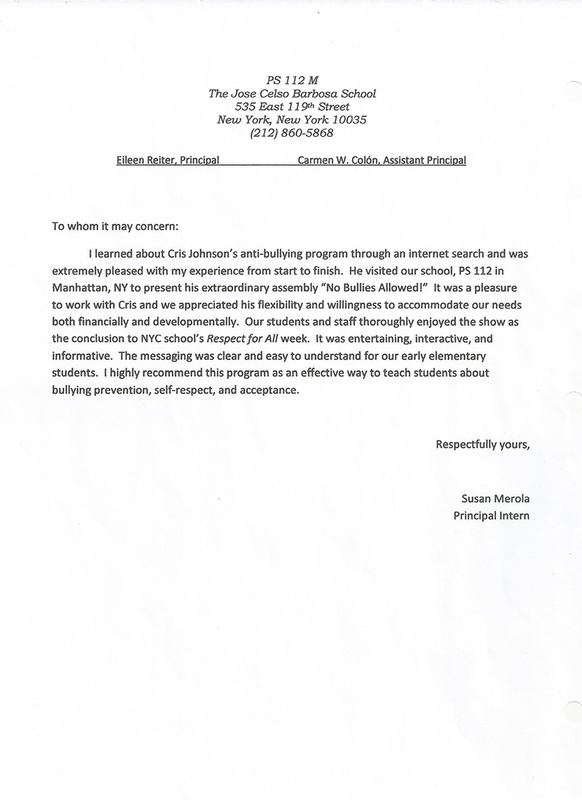 Therefore, any kind of incoming bullying prevention program needs to strike a delicate balance between fun and engagement with important lessons and concepts. This is the assembly topic that I remain most passionate about because it happened to me so much. 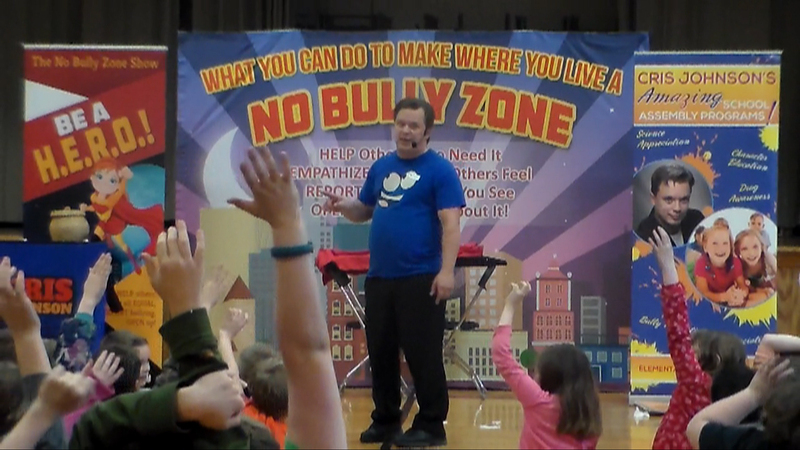 Fortunately, my “No Bully Zone” assembly program truly entertains kids at the same time as educating them! I use magic to illustrate my concepts: a crazy snake jumping out of a basket to illustrate the different forms of bullying, a Smiley Face bowling ball to show how happy everyone will be in a bully-free school, a talking sketchpad (cleverly named “Sketchy!”) to talk about ‘I Messages,’ and at the end of the show, I FLOAT one student in the air to demonstrate the concept of courage! 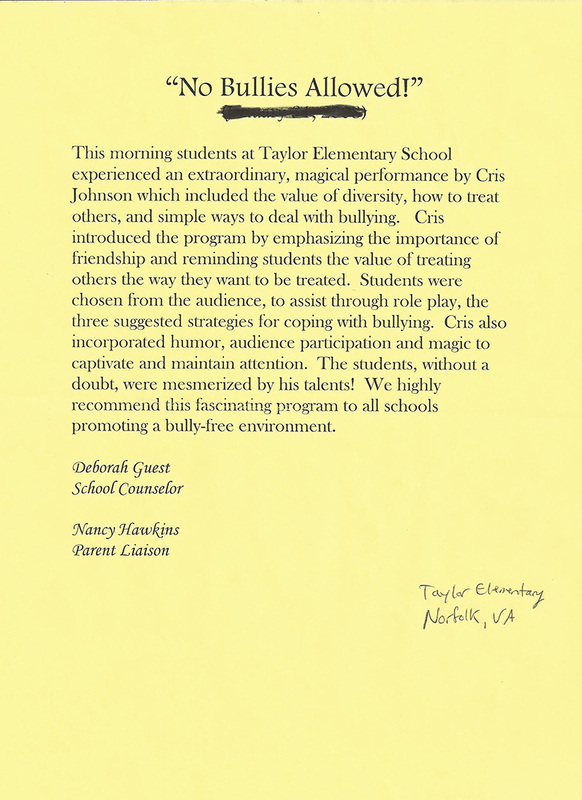 This Assembly Program EMPOWERS Your Students! 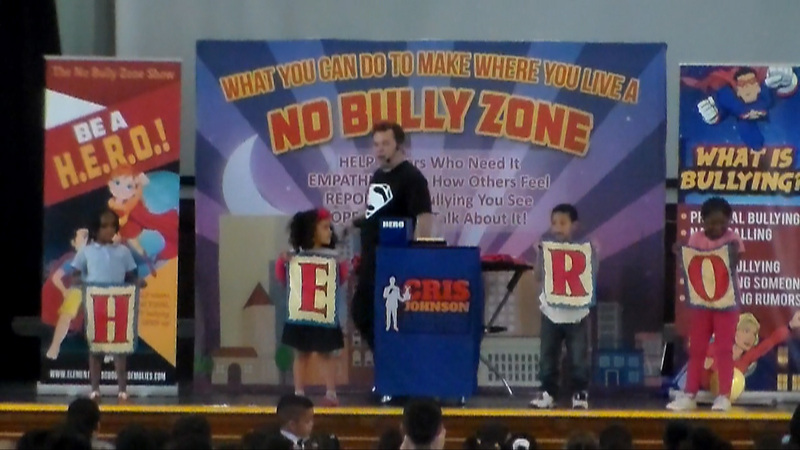 I enhance the entire show with a superhero themed backdrop and banners to visually reinforce the idea that the kids themselves can be H.E.R.O.s as long as they Help each other, Empathize with their classmates, Report bullying behavior, and Open Up to talk about it. Acronyms are powerful memory aids and besides, I wanted this assembly program to be much more than just “hey kids, don’t bully!” Rather, I’ve worked very hard to give the students who attend this assembly a clear understanding of what constitutes bullying behavior, how to prevent it on their part, and perhaps most importantly, options of what they can do if they see bullying behavior or encounter it directly themselves. In short, the kids come away with an easy-to-remember-acronym which helps them help themselves…which has the potential to take some pressure off teachers and faculty. Those are some of the high points of the show, but the point is this: kids respond to this show in positive ways. 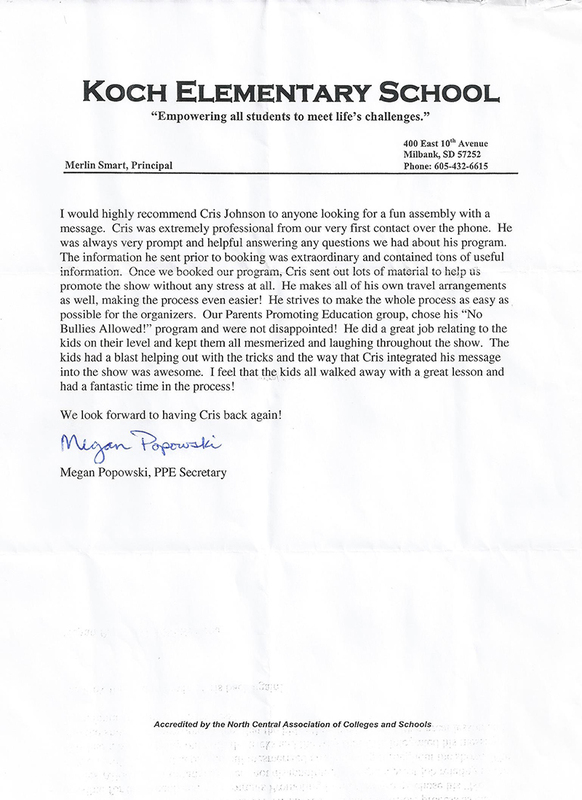 I receive emails from satisfied clients telling me all about how their students’ parents called to tell them how much their kids retained from the program. That We All Need To Work Together! Additionally, this bullying assembly program stresses the fact that we all need to look out for each other…in other words, if you see someone being bullied, get involved! Get help for the person being bullied! One of the keystones of this presentation is the fact that bystanders need to get involved and get help for fellow students being victimized. Don’t just be a bystander…how you can use the acronym H.E.R.O. and help others! If you need it, ask for help from a trusted adult! There is a heavy emphasis on the word RESPECT and DIVERSITY. – What can kids do? – What can adults do? This program can be booked on its own or is available at a discounted rate if booked on the same day as your school’s bullying school assembly programs with me. 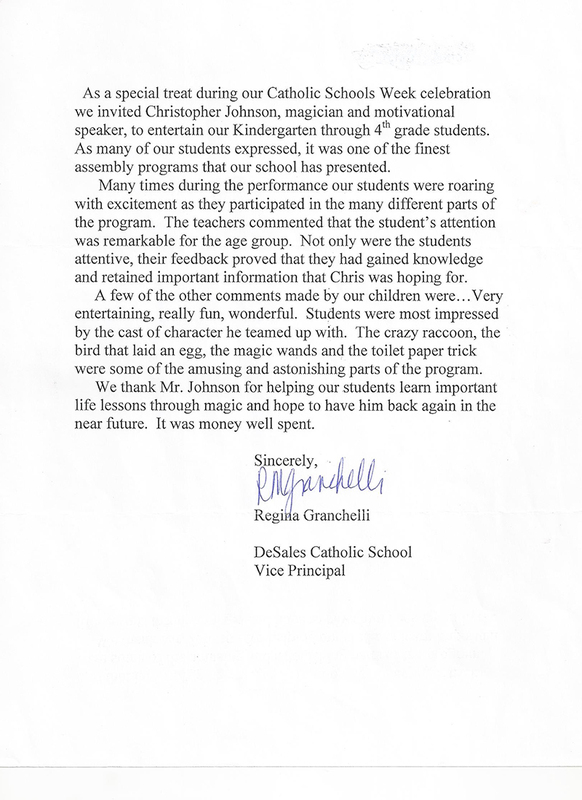 Read Important Information About Cris Johnson’s School Assembly Programs. We were all very pleased with the show that you put on. 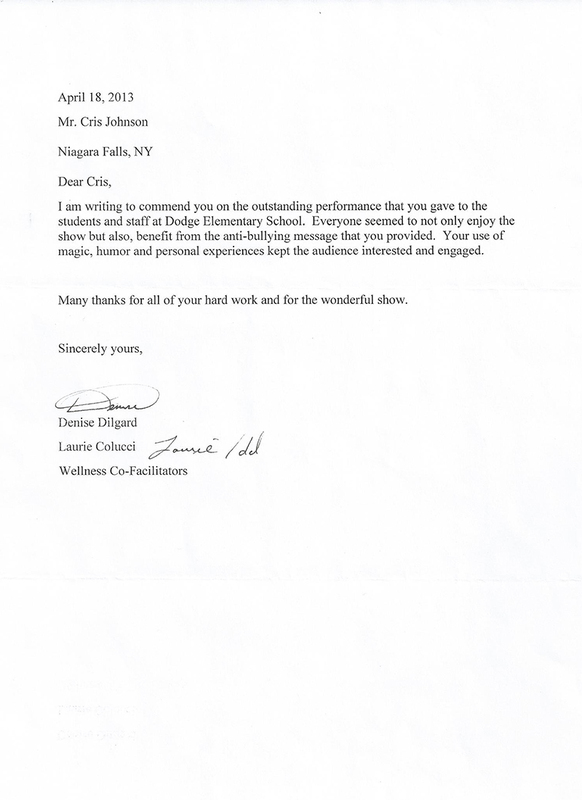 You and I spoke that day at the end of each performance, but I wanted to let you know a few specific things I received in terms of feedback. 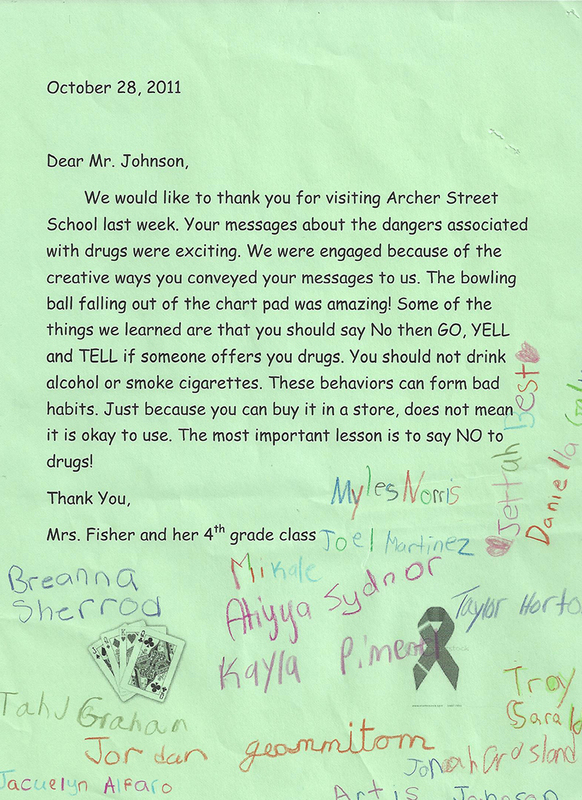 First, we probably could have helped out a little better by dividing the kids into lower and upper grades. 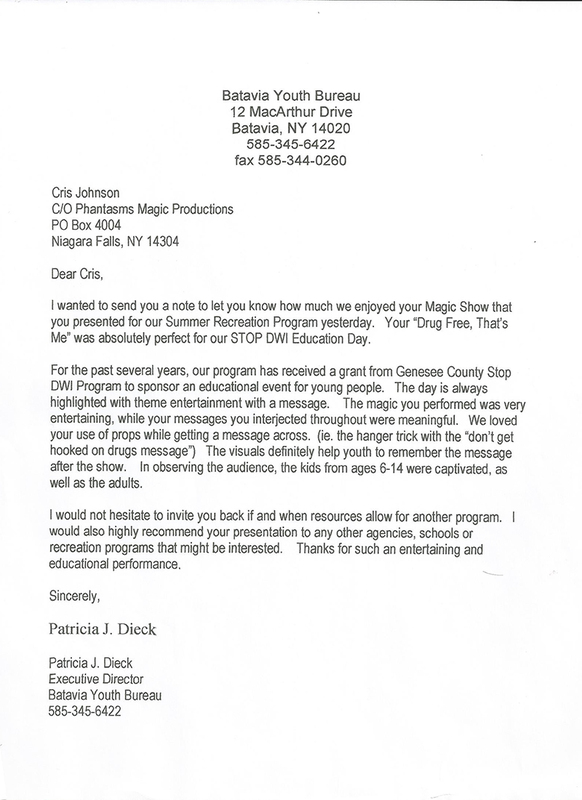 However, your messages and magic tricks were appropriate for all and played to all grade levels. I saw just as many fifth graders amazed by the magic and jumping out of their sitting positions to volunteer as I did kindergarten and first graders. 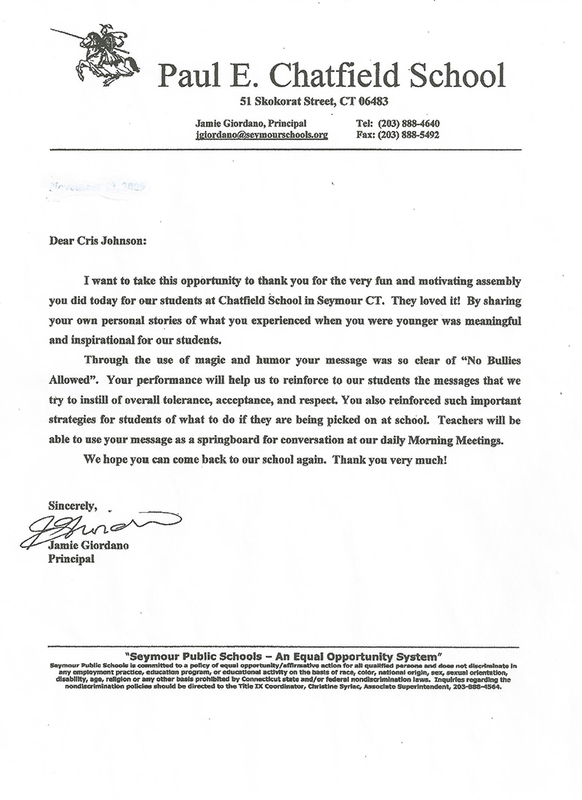 Feedback from all grade levels was equally positive. We liked that the show was interactive and helped make the general audience, as well as specific students, a part of the performance. Furthermore, your messages and main themes were all clearly explained and to the point. 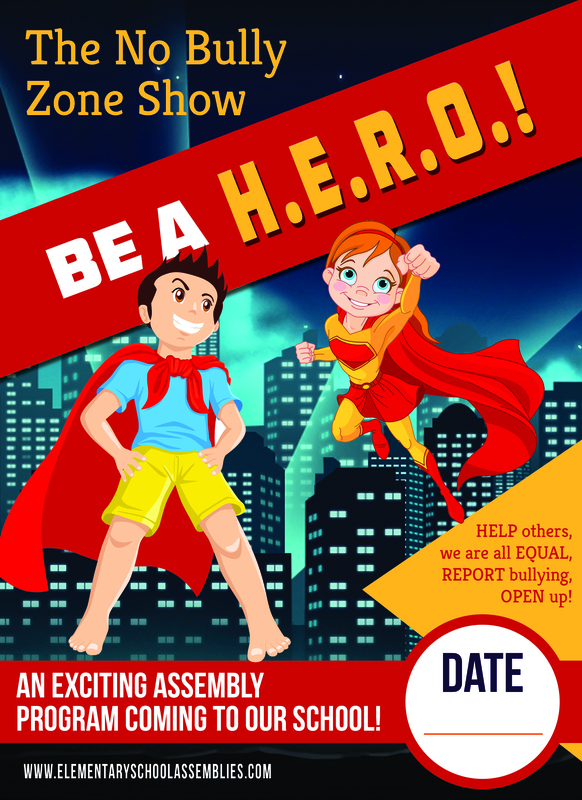 Students came away from the performance understanding what it means to be a “HERO” and how they can help those being bullied or handle it if it happened to them. I can actually say I’ve used a few of the points you made since I saw the show (making sure to tell an adult, asking the other person to stop) in dealing with interactions and issues between students. Finally, we have laminated and proudly displayed “Sketchy” in a few spots around the school as a reminder of the show! From an administrative viewpoint, we appreciated how easy you were to work with and the ease of setting up and breaking down the show. 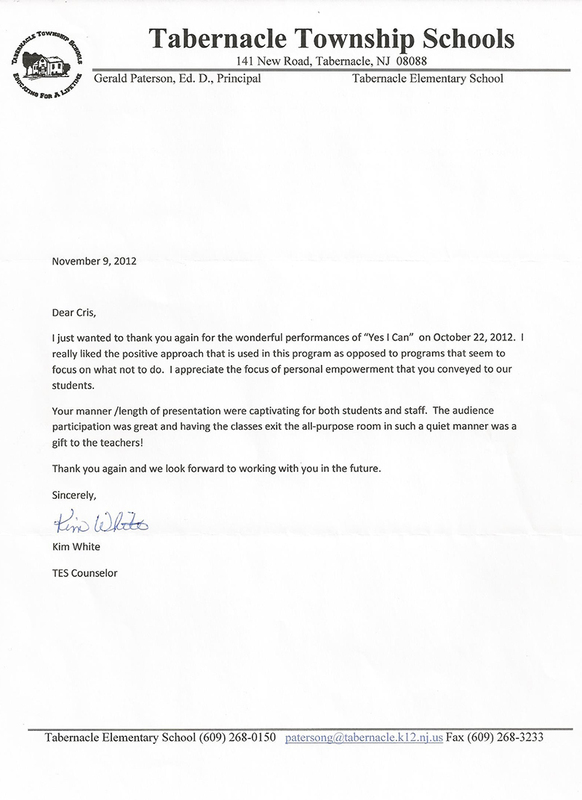 It allowed us to focus on managing the flow of students and getting the shows started promptly. 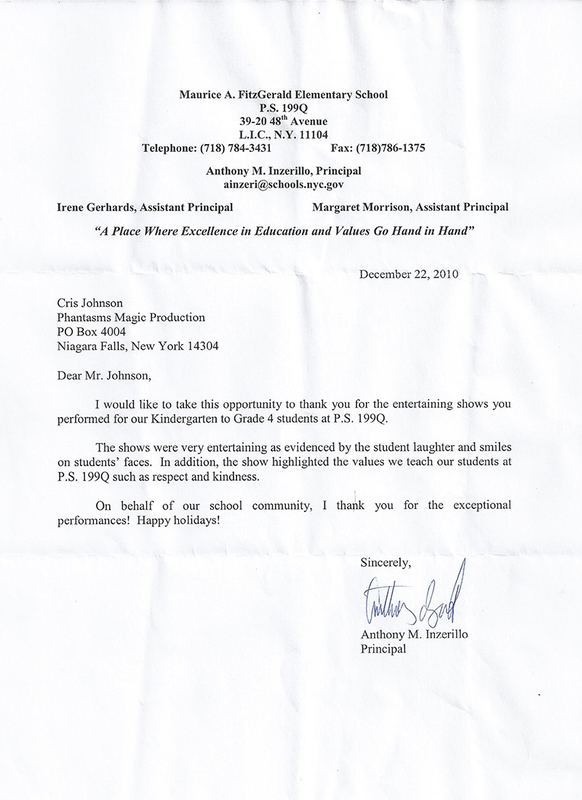 Thank you for a quality performance and for bringing much happiness to our students that day and the days to follow. We would definitely be interested in trying to bring you in for another show in the future. 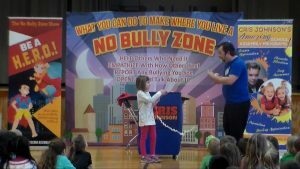 “No Bully Zone” assembly a big hit. This assembly had a great message and Cris kept students interested for the forty-five minute time frame. The flow between his magic and the H.E.R.O. message was seamless. I really liked the way he involved our students and his interactions were warm of friendly. His experience in schools was evident in the way he gets students focused and the strategies he uses to control a large audience are outstanding. I would recommend him to any school. 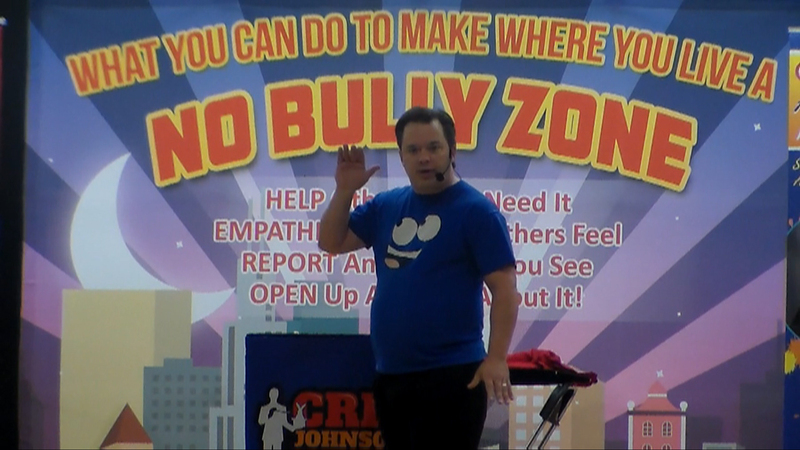 We just had Cris Johnson at our school for the No Bully Zone assembly and it was excellent!! 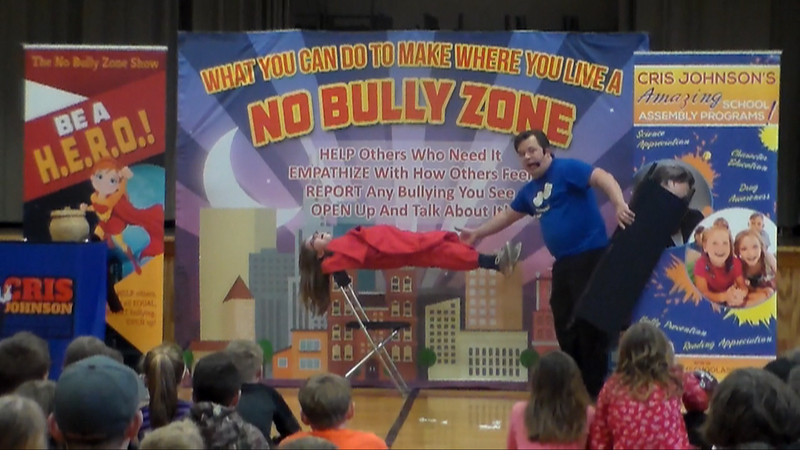 All students were very engaged with the magic tricks, and important lessons on what to do when you see, or are experiencing bullying. Students said their favorite part of the magic, was to see one of their classmates float. After the assembly many of my students came up to me and said how much fun they had and that they want Cris to come back!